Ebron caught five of nine targets for 51 yards in Saturday's 31-13 divisional-round loss at Kansas City. 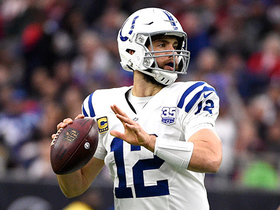 Analysis: The Colts were unable to get into any sort of an offensive rhythm Saturday as they didn't get on the scoreboard offensively until the fourth quarter. The 25-year-old was unable to extend his touchdown streak to three games, but the five catches are his highest total since he caught 10 in Week 13 at Jacksonville. Ebron (hip) does not carry an injury designation for Saturday's divisional-round playoff game against the Chiefs after practicing fully Thursday. Analysis: After being limited at practice Wednesday, the tight end graduated to a full session Thursday, paving the way for him to be a go this weekend. In 17 outings this past season, including the playoffs, Ebron racked up a fantasy-friendly 15 TDs. He'll be working Saturday against a Kansas City defense that was 31st in the league in terms of passing yardage, while allowing 30 TDs through the air in 2018. Ebron (hip) was listed as a limited practice participant Wednesday, Andrew Walker of the Colts' official site reports. Analysis: Ebron was deemed a non-participant in Tuesday's walk-through session, but his return to work Wednesday puts the tight end on track to suit up for Saturday's divisional-round game against the Chiefs. In 17 appearances this season, Ebron is averaging a so-so 45.6 yards per game, but has racked up a fantasy-friendly 15 touchdowns. Ebron was held out of Tuesday's walkthrough due to a hip injury. Ebron caught three of six targets for 26 yards and one touchdown in Saturday's 21-7 win at Houston. Analysis: Like all of the Colts' pass catchers, Ebron did his work in the first half as they took a 21-0 lead into halftime and cruised to victory in the second half. Kansas City awaits in the divisional round, featuring a defense that ranks second worst in the NFL with 273.4 passing yards allowed per game. Ebron was held out of Wednesday's practice for rest purposes, Andrew Walker of the Colts' official site reports. Ebron (concussion/knee) is listed as active for Sunday night's game against the Titans. Analysis: Officially active after practicing fully Friday, Ebron merits lineup consideration in Sunday night's win-or-go-home showdown, given that he's logged a fantasy-friendly 12 touchdowns in 15 games to date. Ebron (concussion/knee), who is listed as questionable for Sunday's game against the Titans, is optimistic he'll play, sources told Ian Rapoport of NFL Network. Ebron (concussion/knee) is listed as questionable for Sunday night's game against the Titans after practicing fully Friday, Kevin Bowen of 1070 The Fan Indianapolis reports. Analysis: Ebron progressed from a limited practice session Thursday to full-go Friday, and the Colts are optimistic that the tight end will be cleared by an independent neurologist Saturday. Assuming that's the case, Ebron -- who has scored 12 touchdowns in 15 games to date -- will merit fantasy consideration in Sunday night's win-or-go-home showdown versus Tennessee. Coach Frank Reich said Ebron (concussion) needs to gain clearance from an independent neurologist to play Sunday night at Tennessee, Mike Chappell of Fox 59 News Indianapolis reports. "We're optimistic," Reich added. Analysis: Ebron practiced in a limited fashion Thursday and appeared to maintain that activity level Friday, but the final hurdle of the concussion protocol remains. The tight end likely has an evaluation scheduled for Saturday, at which point his availability (or lack thereof) will become known. If Ebron isn't cleared, fellow tight end Mo Alie-Cox would be the biggest beneficiary. Ebron (concussion/knee) was officially limited at practice Thursday, Kevin Bowen of 1070 The Fan Indianapolis reports. Analysis: Ebron's return to practice Thursday is a step in the right direction and he "has a real chance to play" Sunday night against the Titans, per Bowen. Given the playoff implications of the Colts' Week 17 contest, Ebron will no doubt push to play this weekend, but ultimately his status hinges on progressing fully through the NFL's concussion protocol. Ebron (concussion/knee) was spotted at practice Thursday, Zak Keefer of The Indianapolis Star reports. Analysis: Ebron's presence on the field is a good sign, but we'll have to see if the tight end is officially upgraded to a limited practice participant Thursday after sitting out Wednesday's session. Ebron (concussion/knee) was listed as a non-participant in Wednesday's practice, Andrew Walker of the Colts' official site reports. Ebron (concussion) wasn't spotted at practice Wednesday, George Bremer of The Anderson Herald Bulletin reports. Analysis: Initial reports suggested that the tight would log a limited session, but it appears as though he'll be listed as a non-participant on the Colts' first practice report of Week 17. With Ebron still in the NFL's concussion protocol, the Colts have added Erik Swoope to their practice squad to add more insurance at tight end. Swoope would likely be promoted to the active roster if it's apparent Ebron won't be ready to go for Sunday's all-important matchup with the Titans. Ebron (concussion) will be limited at practice Wednesday, Kevin Bowen of 1070 The Fan Indianapolis reports. Ebron was forced out of Sunday's game against the Giants with a concussion. Analysis: Next up for the Colts' tight end looks are Mo Alie-Cox and Ryan Hewitt, with Ebron now a player to track in advance of the team's regular-season finale next weekend against the Titans. Ebron potentially suffered a concussion during Sunday's game against the Giants, George Bremer of The Anderson Herald Bulletin reports. Analysis: Prior to heading to the locker room after being examined in the Colts' medical tent, Ebron caught three of his five targets for 28 yards. Next up for the team's tight end looks in Ebron's absence is Mo Alie-Cox. Ebron (quad) returned to a full practice Thursday. Analysis: Ebron sat out Wednesday's session, but his return to a full practice Thursday suggests that his absence was maintenance-related. A disappointing one-catch effort in Week 15 aside, Ebron has been one of the better fantasy options at the tight end position this season, having logged 59 catches on 99 targets for 662 yards and 12 TDs in 14 games. He's an obvious bounce-back candidate Sunday against the Giants. Ebron didn't practice Wednesday due to a quadriceps issue, Andrew Walker of the Colts' officials site reports. Analysis: Ebron turned in a more muted performance than usual in the Week 15 win over the Cowboys, playing 38 offensive snaps and catching just one of his three targets for eight yards. So far there's nothing to suggest that his availability for Sunday's game against the Giants is in any danger, but he would erase any concern about his status by practicing fully Thursday or Friday. Ebron caught one of three targets for eight yards in Sunday's 23-0 win over the Cowboys. Analysis: Ebron surprisingly finished with just three targets, but he hardly made the most of his looks. He had a drop on a play that should have resulted in a big gain and took a big shot on another deep pass. Ebron rolled into the game with 19 catches and three touchdowns over his last three, so this dud performance in a favorable matchup on paper is a bit disappointing. He'll look to get back on track next Sunday against the Giants. Ebron caught four of eight targets for 65 yards and a touchdown in Sunday's 24-21 win over the Texans. Analysis: Ebron gave the Colts the lead for good when he hauled in a 14-yard pass with just under three minutes remaining in the first half. The 25-year-old has now scored in all but four games this season, and as a result, he's considered a top-10 tight end for fantasy purposes over the rest of the season. He'll try to reel in another score at home Week 15 against Dallas. Ebron (illness/back) doesn't have a designation on the Colts' final injury report for Sunday's game in Houston. Ebron (illness/back) took part in Friday's practice, Kevin Bowen of 1070 The Fan Indianapolis reports. Analysis: Ebron missed the last two days of practice because of the ailment, but it appears he was feeling good enough to get back on the field for the Colts' final session of the week. His participation alone puts him on track to suit up in Week 14 against the Texans, but his official status will be revealed after Friday's practice wraps up. Ebron remains under the weather as of Thursday, Kevin Bowen of 1070 The Fan Indianapolis reports. Analysis: The tight end has also been managing a back issue of late, but his illness is evidently the culprit for his absence from practice Thursday. As long as Ebron practices Friday, in a any capacity, he'll be on track to play Sunday against the Texans. Ebron (back/illness) didn't practice Wednesday. Analysis: Ebron was also held out of practice last Wednesday with a back issue before practicing fully the next day. With that in mind, it wouldn't be surprising to see the tight end back on the field Thursday, assuming his illness doesn't linger. Ebron doesn't appear to be practicing Wednesday, Kevin Bowen of 1070 The Fan Indianapolis reports. Analysis: Ebron was held out of practice last Wednesday with a back injury, but he returned to full participation the following day and hauled in 10 of 16 targets for 81 yards in Sunday's 6-0 loss to the Jaguars. Barring any report of a new injury, he should be headed for another heavy workload Week 14 against a Houston defense that has allowed the eighth-most receiving yards (852) to tight ends this season. Ebron is averaging 11 targets in six games with Jack Doyle (kidney) out of the lineup this season. Ebron caught 10 of 16 targets for 81 yards and lost a fumble in Sunday's 6-0 loss to the Jaguars. Analysis: Ebron's fourth-down fumble in the second quarter led to a Jaguars field goal on the ensuing possession. Besides that play, Ebron had a productive day considering his team failed to score any points. The former Lions tight end should see all the targets he can handle the rest of the way with Jack Doyle on injured reserve due to a kidney injury. 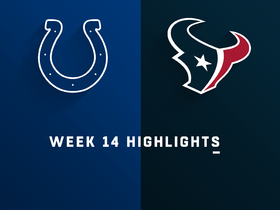 Indianapolis will face the Texans on the road Week 14. Ebron (back) practiced fully Thursday. Analysis: The tight end's return to a full session Thursday suggests that Wednesday's absence was maintenance-related. With Ebron slated to play Sunday against the Jaguars, he profiles as one of the more appealing fantasy options at his position in Week 13. Not only has he scored 11 TDs in as many game this season, but Ebron's weekly floor (in terms of snaps and targets) should be boosted by the placement of Jack Doyle (kidney) on IR. Ebron (back) was spotted at practice Thursday, Kevin Bowen of 1070 The Fan Indianapolis reports. Analysis: We'll have to see how the Colts list the tight end's participation level, but his return to the field Thursday after missing Wednesday's session bodes well for his chances of suiting up Sunday against the Jaguars. Ebron didn't practice Wednesday due to a back issue. Analysis: It remains to be seen if the back issue is a minor concern that the Colts are managing through the week or if Ebron's status for Sunday's game against Jacksonville is actually in any danger. Another update on Ebron's situation should come Thursday once the team's second practice of the week is underway. 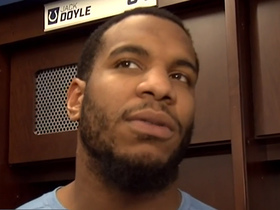 With Jack Doyle (kidney) on injured reserve, Ebron -- who was already highly productive as the No. 2 tight end -- seems destined to see extra snaps the rest of the season, health permitting. 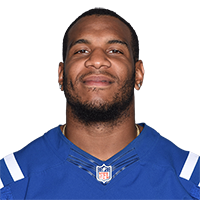 Ebron is expected to step into an enhanced role for Indianapolis' final five contests of 2018 after the team announced Monday that fellow tight end Jack Doyle (kidney) will miss the rest of the season, Andrew Walker of the Colts' official site reports. Ebron caught five of seven targets for 45 yards and two touchdowns during Sunday's 27-24 win over the Dolphins. Analysis: Ebron finished second on the team in targets as he tied his second-best catch total of the season. He was shut out last week, but he bounced back with touchdown catches in the first and fourth quarters. Ebron's emergence as an elite red-zone option has been swift: He's now tied for the league lead in receiving scores through 12 weeks. 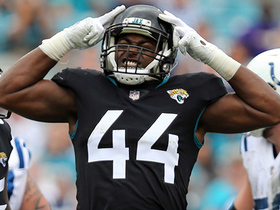 He'll look to keep it going next Sunday against a Jaguars team he dominated in the previous matchup (three touchdowns in Week 10). Ebron did not have a reception and was not targeted in Sunday's win over Tennessee. He played 25 of the offense's 62 snaps. Analysis: Ebron did't have a reception a week after he had three touchdowns in the Week 10 win over Jacksonville even though he played more snaps Sunday than the week before (21). Ebron drew extra attention from the defense given his red-zone success as he had a cornerback covering him frequently, according to Kevin Bowen of 1070 The Fan Indianapolis. Ebron caught all three of his targets for 69 yards and two touchdowns Sunday against the Jaguars. He also scored a two-yard rushing touchdown in the 29-26 win. Analysis: Ebron did all his damage early on, including a 53-yard receiving touchdown on the opening drive and a short rushing score on a gadget play at the end of the first quarter. He reached the end zone again via a 12-yard reception in the second, giving him 10 touchdowns in just nine games this season. 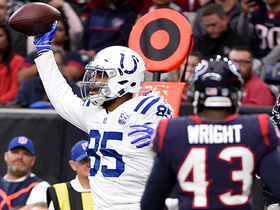 Ebron's role as Andrew Luck's top red-zone weapon has vaulted him into must-start territory, and he'll look to continue his outstanding campaign next Sunday against the Titans. 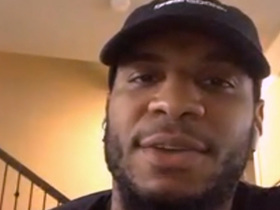 Indianapolis Colts tight end Eric Ebron joins "Up to the Minute" to talk about his offseason, expectations for 2019 and more. 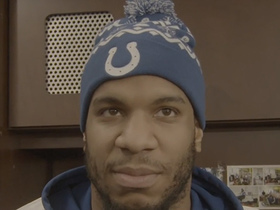 Indianapolis Colts tight end Eric Ebron describes the Indianapolis Colts locker room vibe going in to Week 19 against the Kansas City Chiefs. Indianapolis Colts tight end Eric Ebron shares how he is feeling going into the AFC divisional contest against the Kansas City Chiefs. 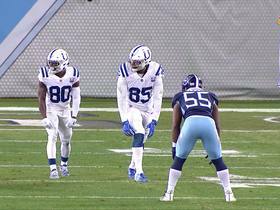 Indianapolis Colts unveil 'Drumline' celebration after tight end Eric Ebron's 14th touchdown of 2018. Indianapolis Colts quarterback Andrew Luck rips pass to tight end Eric Ebron for third-and-long conversion. No one lines up across from Indianapolis Colts tight end Eric Ebron, so quarterback Andrew Luck immediately hits him for big gain of 23. 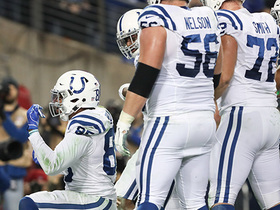 Indianapolis Colts tight end Eric Ebron remains untouched, and rolls over to clock in a 14-yard touchdown. 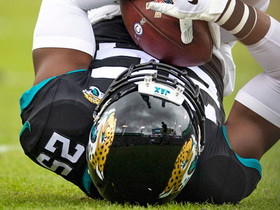 Jacksonville Jaguars CB D.J. Hayden makes leaping grab to pick off Colts QB Andrew Luck.